I still have two parts of the Reintroduction to write, but I’ve been a bit busy of late to knock them out. I’m preparing for a road trip down to California. I’ll be driving the car of one of my roommates from this summer down to her in Culver City, hanging out for a few days, then taking the train back to Portland and the bus back out here to the coast. I leave Friday and will follow the coast down. Since I’m working most of the day tomorrow, I don’t expect to have another post written until next week some time, most likely. And that’s assuming I get a chance to write while in California. Interestingly, the next post in the Reintroduction is going to be about the social aspects of my life—the loneliness that has arisen at times due to the path I’ve chosen as well as the opportunities to meet new and fantastic people. The two women I’ll be visiting in California—whom I lived with this summer—will be an element of that post. The woman I’m currently seeing in Portland—another small reason I have yet to get up a new post—will also be mentioned in brief. I suppose it’s appropriate that my post on social realities and loneliness has been delayed by the prioritizing of friends and social interaction. Anyway, since no new written post is imminent, I thought I could at least provide you all a few pretty pictures. In keeping with the theme of the last post, here are a few shots of my efforts to keep the harvest. 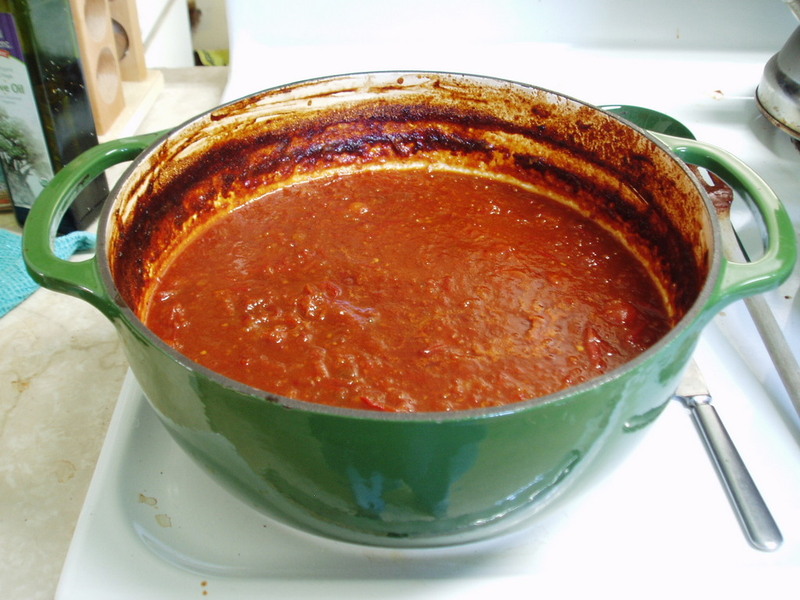 Tomato jam, made primarily from cherry tomatoes, getting ready to be canned. 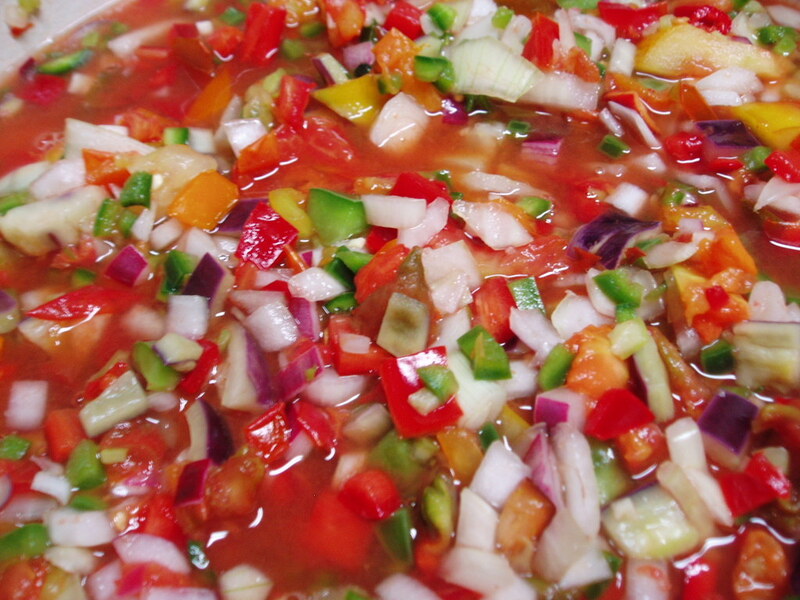 This is a mix of sweet and spicy, though much heavier on the sweet than the spicy. I made two batches—the first was even sweeter than the second. I prefer the second. It’s pretty fantastic on a grilled cheese sandwich. The recipe came from Food In Jars. This isn’t actually keeping the harvest so much as just the harvest. 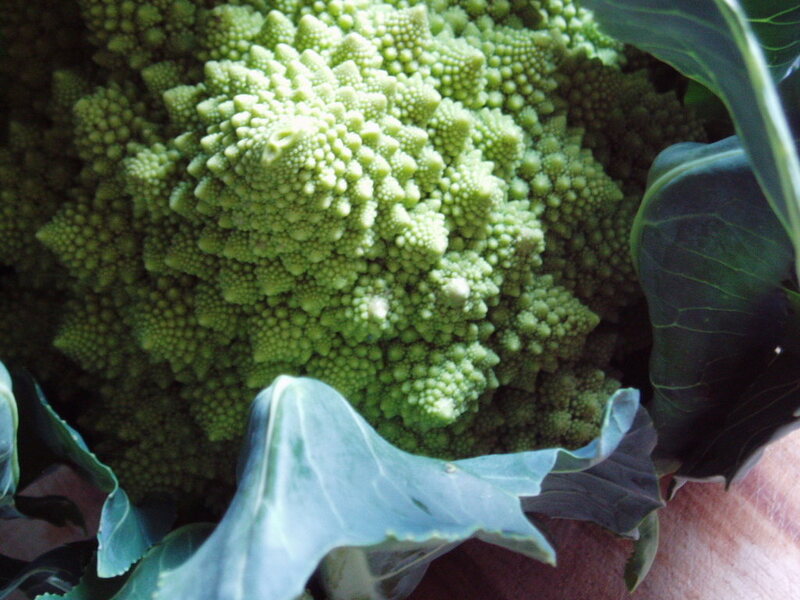 Romanesco is a brassica that essentially is a cross between broccoli and cauliflower. The result is an incredible flower that grows in a fractal pattern. It’s also delicious when roasted, with a slightly sweet and nutty flavor. It just came on in my garden and this is a shot of the first head harvested and eaten. This is the first of several reintroduction posts in anticipation of resuming this blog for the fall, winter, and hopefully beyond. I’ve been absent for multiple months now, so I’ll be setting the stage of where I am right now and what’s been happening in my life. That will all lead into my plans for this blog over the next several months, which are going to be tweaked a bit from what I was doing last winter. It’s hardly rained since I last posted here. Some days it feels so dry. The humidity is low. The deep blue September sky has transitioned to the deep blue October sky. The sun is surprisingly harsh. I’ve noticed the last few years—once I began farming—how intense the September sun is. Even though it’s usually cooler than in August, direct sunlight seems somehow merciless, more draining than during the hotter days of July and August. This year has been no exception. September was a month of almost no rain and few clouds or fog, even. Just intense sun. In fact, July through September was the driest on record in Portland. While I’m not sure if that holds true out here on the coast as well, it’s been one of the driest summers here, too. I’d guess we’ve received maybe an inch of rain in those three months, and there’s been none so far this month. The couple rains we did receive wet things down but did little else. It never penetrated deep into the soil. The creek we get out water from is low. The creek at the farm just down the road I worked on last year is almost dry, though there’s still enough behind the small dam to supply their water. It shocked me, though, when I walked back there about a week ago and saw the stagnant puddles and mere hint of trickle that now makes up the creek I normally know as a healthy flow. The direct and immediate connection to water out here keeps these dry days ever more present in the mind. The pastures are brown and thin, yet the cows and sheep still seem to be finding food. We’ve been feeding hay, but not massive amounts. The animals are mostly staying out on the grass—dead as it appears—for the time being, rather than spending most their time in the barn where the hay can be found. Last week, the wind kicked up, though now it’s died back down. It was nice in the sense of variety, but it further dried things out. I could feel it on my irritated skin, my chapped lips, in a strong desire for a good rain storm that continues even now. Of course, this is nothing like what the Midwest has seen this year. I don’t mean to be wringing my hands so much as describing the reality out here—a reality so different from the one I experienced last summer when we received semi-regular rain even during our dry months. We normally receive 90-100 inches of rain annually and the winter months are dominated by clouds and rain. It’s odd to have gone so long without any good storms, without the occasional dumping of precipitation. It feels so antithetical to this climate. In many ways, of course, it’s been nice and I think a number of vegetable growers are appreciating it, even if they are starting to feel the need for a good rain storm. But working now on the animal side of things, I see these dry pastures and hear about the hay bills, eye the barely-trickling creeks and see this flip side of the coin—the danger of too little water. Luckily, we had a wet spring, so we had a good base from which to deal with this dryness. Still, it’s been interesting seeing the reactions even of my friends who hate all the rain we get in the Northwest. Most all of us are feeling ready for a storm—even those who aren’t eyeing a low creek or worried about feeding animals. Sure, we love the sun we get—especially with how limited it is in this region—but the reality is that we’re all adapted to a climate that just normally isn’t this dry, even during our natural drought months. The leaves are turning and dropping, and yet it still doesn’t quite seem like fall. The wind and rain is missing. The dark dreariness. That constant wet chill. It’s not the loveliest sensation in the world, lord knows, but it’s what should be. And so it’s missed. In 1952, after receiving only a half inch of rain from July through September in Portland, it stayed relatively dry all through November. Hopefully that doesn’t happen this year; it’s not appearing that it will. The rain is supposed to start tomorrow and we may be in for as much as five or six inches over the next few days here in the coastal range, though the models seem to be backing off that extensive a scenario. A possible deluge, perhaps. A good rain, almost surely. A reprieve, for sure. “It’ll make up for it,” one old farmer’s said to me about this dry weather. I suspect that’s true. While the rain beginning tomorrow may be followed up by another dry spell to close out the month, I suspect November’s going to be a soaker. It probably won’t be long before we all forget just how dry this summer has been. It won’t be long before we’ll be dying for a cold, sunny day—anything to remind us that the sun’s still out there, that our little star hasn’t collapsed and disappeared. Anything for a break from the constant dreary drizzle and downpour, the multiple different types of rain, each of which we have names for here, sometimes all of them falling in the same day. But still, I can’t wait for that first heavy rain and wind, to see these falling leaves through a prism of water, to hear the creeks roaring again and watch the mud and muck build, as annoying as it is. It’s not the most glorious of conditions, but it’s ours. I look forward to that (literal) cold comfort.